Jennifer Goodhue keeps Tu-Lu’s Gluten-Free Bakery running like a well-oiled machine. As chief operating officer of Tu-Lu’s New York City location, she oversees all aspects of the bakery. Goodhue, who has celiac disease and a passion for baking, originally worked in finance, and her background has proven invaluable in the day-to-day operations. A visit to see how she spends her day seemed perfect given that we are fast approaching Valentine’s Day, with its devotion to all things sweet. Goodhue joined Tu-Lu’s in June 2011 after being introduced to the bakery’s owner and founder, Tully Phillips. Philips, a graduate of Le Cordon Bleu in Austin, TX, opened the bakery in February 2010, two years after receiving a diagnosis of gluten-intolerance. Since launching her first bakery, Philips moved to Dallas where she has opened two more Tu-Lu’s locations. 11th Street in New York City to spend the morning with Goodhue, who kindly opened the door for me before regular bakery hours. Truth be told, she also opened up a folding chair so I could sit alongside her while she worked at the desk in her office downstairs. This provided the perfect opportunity to watch her start the workday and see her financial and organizational skills in action. My view was very colorful since I could see stacks of containers filled with sprinkles in a rainbow of hues. And I could smell baked goods being prepared upstairs. Goodhue noted that she has habit of counting everything, “If I am on a walk, I count how many geese there are,” she said. She puts her number skills to good use keeping track of everything at Tu-Lu’s from how many of a specific cupcake were sold yesterday to which items were most popular last Valentine’s Day. Here’s a glimpse of her typical day at the bakery. My morning routine starts at 5:00 a.m. with the gym at 5:30 a.m. and I stay there until 7:00 a.m. Afterwards, I either drive into the city or catch the 7:18 a.m. train from my home in Katonah, New York. I usually have this every weekday: gluten-free rolled oats with half a banana, some almond butter, some cinnamon and cacao nibs and three hardboiled egg whites. That is my protein/fuel/carb ratio to get me through a stretch of time. I usually eat as I do the scoop and bake list. What’s the scoop and bake list? The scoop list outlines the specific items and quantities baked for a specific day. Our bakers reference this list so that they know exactly what to bake in the morning and how much of a certain item is needed. For example, 36 coffee cakes or 24 vanilla cupcakes are needed. What’s happens when you get to the bakery? I greet my team and check in. Then I look at all the special orders or wholesale orders for the next day to determine quantity projections for the bakery case. This dictates how much of a certain item and which specific item our bake team should bake in the morning. When making the list, I look at the weather. Is it going to be another blizzard? I will access numbers and look at how we did the day before. How many loaves of bread did we sell? Are there cupcakes left? If a certain product has a surge, I definitely want to include that item in the case. If it were a holiday, I would take that into account and increase our numbers. Once a week, I open the bakery myself. It is important to see a few different perspectives at the bakery including the perspective of the customers and my employees. Valentine’s Day is coming up. How do you prepare and what are you selling? Every holiday, I go back and look at the numbers from the year before. For example, exactly how many Raspberry Linzer cookies did we sell? Today (the day of our interview) is three weeks out from Valentine’s Day and I am going to have a conversation with the bake team to further prepare. Valentine’s Day is a big cupcake holiday. The biggest cupcake holiday we have. This year, we are making cute four-inch cakes in heart shaped pans. You can choose chocolate or strawberry. We have vegan cake options as well. We sell boxes of cookies that spell out “LOVE”. I actually just ordered Valentine’s Day sprinkles. The packaging is important too. We have some fun packaging. Our heart-shaped sugar cookies are packaged in clear cellophane bags and tied with festive Valentine’s ribbons. 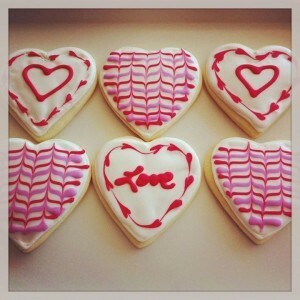 Our “LOVE” shaped sugar cookies come in a white window bakery box, so that you can see the cookies inside. They sit on pink crinkle paper and are tied with a Valentine’s grosgrain or organza bow. The store is festively decorated with pink and red heart banners. There are also owls holding hearts, as a nod to the bakery mascot! How does Tu-Lu’s use social media as part of the bakery business? I love the social media aspect and getting something we just created spun out there. 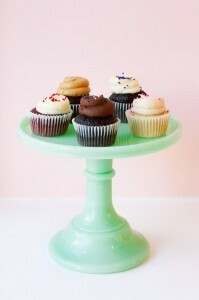 For example, each Thursday we roll out our cupcake flavor of the week and put it up on Instagram, Twitter and Facebook. A lot of customers come into the bakery and announce that they saw our cupcake flavor of the week and are excited to try it! I usually bring lunch from home. I bring quinoa, sweet potato or brown rice with vegetables – spinach, green beans, celery or cucumber – with chicken. I finish lunch by eating two dates. I love occasionally getting quinoa salad at a store nearby. If I really want a treat I get a smoothie. I always take notes and make to-do lists. It helps me be prepared and stay organized. I am always looking around and assessing our inventory. We have tons of supplies and ingredients, so there is a lot to take into account. Do we need eggs? Do I need to order cupcake liners? Do we have enough buttermilk? Do you sample sweets during the day? I sample when we are experimenting. Saturday is my personal sweet day. After dinner I have dessert. I think about what I am going to eat all week! Anything surprising about your job? There is a whole other side to running a bakery. It’s not always cupcakes and frosting. When you run a business, you deal with it. My day yesterday was dealing with a radiator that wasn’t producing any heat. My employees were freezing and we were all wearing long Johns! It’s especially imperative that I maintain a positive and upbeat attitude when these situations arise, as it really sets the tone for my team and our customers. What time does your workday end? When you run a business, your day never ends. There’s always an email to write, phone call to return, spreadsheet to update, new idea to set into motion, etc. I always make myself available to my team and am constantly checking-in when I am not at the bakery. Since we stay open until 10:00 p..(and 10:30 p.m. on Fridays and Saturdays) I am in communication with my employees that late at night since I like knowing how things are going and if it’s been busy. So really, my day ends when I go to sleep! How has your job influenced your life? My days are filled doing something that I am passionate about — making gluten-free items accessible to people. It’s hard work, and my days are long, but I like what I do! Next up, we’ll find out what it takes to run a national organization. Guest blogger Susan Cohen regularly writes the New for You column for Gluten-Free Living and also contributes to the In the Mix column.